Today's entry is an interview with designer Michael Ostrofsky, the founder of Five PetPlace, a company specializing in super stylish, luxury cat furniture. fivepetplace.com launched in May 2012, and both Michael's company and his products are unlike anything I've seen. While the design and quality of his furniture is readily apparent, he's also a cat person through and through -- and his love for them shows in every aspect of his business. 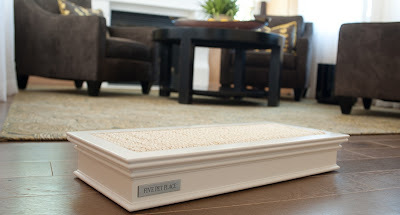 He designed his products to care for his five cats first. Once they used the products on a regular basis, he then styled them to appeal to people. He refuses to make his products in places like China where cats are abused without justice or thought of as food. His company has a Philanthropy program designed to help cats and kittens in need. Help a cat, kitten or shelter out -- and Five Pet Place will reward you up to $50 for doing so when you purchase one of their products. His website has a section called My Pet Place with birthday e-cards for cats, calendars for the people who care for them -- and a special blessing to celebrate the Feast of St. Francis for both. Best of all, they're free for everyone. Michael gave this interview in Pebble Beach, California last year and we're sharing an excerpt of it with you here. Enjoy. So what's Five Pet Place? Five Pet Place specializes in producing attractive and functional products for cats. 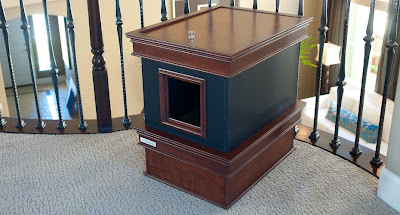 We currently make a Food & Water Server, Litter Tray, Litter Cabinet, Scratching Pad, Scratching Post and Window Bed. We also offer Gift Certificates and are already working on some exciting products for next year. Where did the idea for your products come from? My wife and I had five cats. Each got wet food, dry food and fresh water on a daily basis, so there were 15 bowls scattered around our house and yard. When we weren’t filling or washing them, we were bumping into them and spilling everything all over the place. Since that got old, I went shopping for multiple bowl cat feeders and couldn’t find anything decent. Everything, even the expensive stuff, was tacky looking and poorly made. Some were even dangerous. 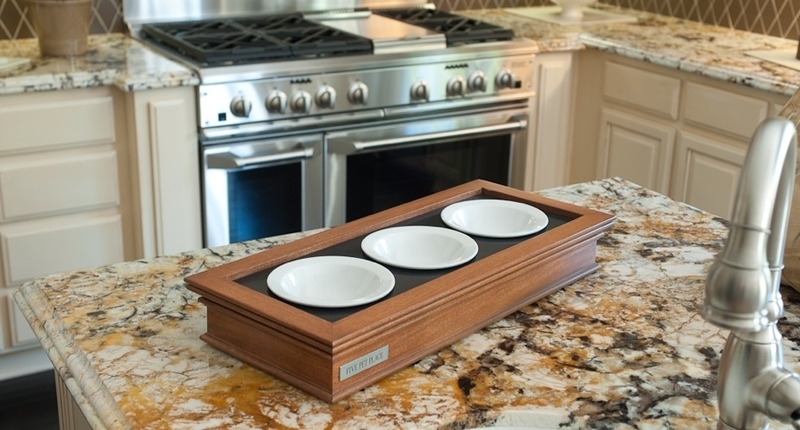 As a result, I designed some Food & Water Servers and built them with my Dad. 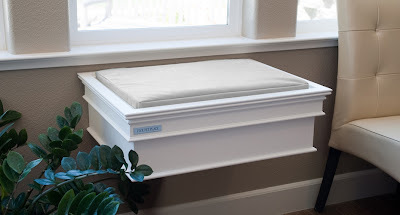 How did you come up with the idea to use crown moulding in your design? Our house had a large beam running across the family room ceiling. It was beautiful and composed with many layers of moulding. After days of trying to figure what a good looking Food & Water Server would look like, I saw that beam and had a “Eureka” moment where the design would look like an extension of my home's cabinetry and trim. When did you decide to start Five Pet Place? After everyone who saw the Food & Water Servers asked me where I bought them. That prompted me to look at the rest of the "cat stuff" in our house, redesign them with a similar theme and bring them to market. Why did you decide to make these particular products? I looked around the house and decided to improve upon the products our cats used on a daily basis. Since they eat, use the restroom, scratch and sleep -- I wanted to make sure all those needs were met with things they really enjoyed so they were as happy as possible. I mean raise the standard of products for cats to an entirely new level of quality, functionality and sophistication. Look at scratching products. They're all hideous -- and the cardboard and carpet ones are loaded with chemicals. They quickly show wear and wind up in the garbage in a few weeks. While there are sisal products out there -- some of them, if you can believe this, use kerosene soaked rope in their construction because that's the only kind of rope you can find in China. Others use a very thin rope because it's cheap -- so the rope wears through, breaks and unravels in a few weeks. What I did was find a thick, natural sisal rope, then figure out a way to tightly pack the rope together while winding it onto an adhesive covered surface. The result is extremely high quality scratching products that last. In fact, the first scratching pad I ever made is still used by my Lucy every morning after breakfast -- and it's almost 8 years old now. That's a really important point I'd like to make about my products. While they're expensive -- they're still an outstanding value. I saw somebody selling a cardboard scratching post for $99 the other day. That's going to be in a landfill in a few weeks because once the paper's shredded, you can't make it look good again. 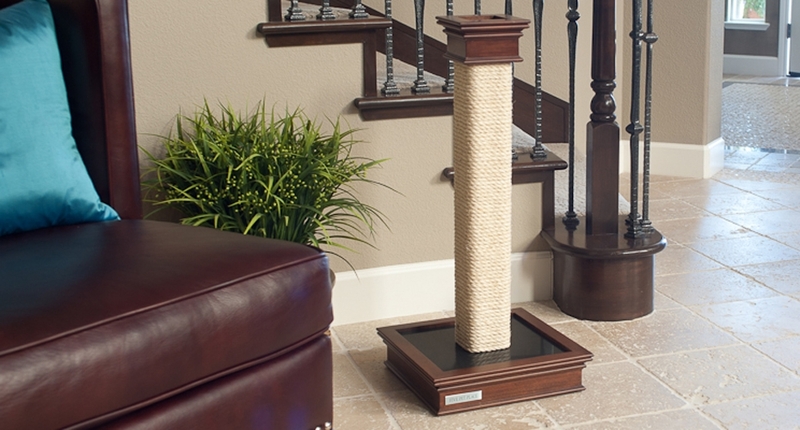 Meanwhile, my Scratching Post, which sells for $375 and up -- is going to last many, many times longer than that -- so you're going to be saving money in the long run. What do you like best about running Five Pet Place? The ability to execute a vision without compromise. When you work for somebody else, unless you’re really lucky and have complete freedom, your ideas always get shot down or watered down by bosses, committees and other employees. Fortunately, I don’t put up with that anymore. The fact I believe we're helping cats living longer, happier and healthier lives. Here's an example. A friend knew somebody who was thinking about putting his 19 year old cat down because it could barely move from arthritis. He asked me to help. Since we had an extra heated bed cushion lying around, I gave it to him. Long story short, the cat loved his bed and is still with us today because his quality of life improved so much. How cool is that? Why go after the high end of the market? We are not going after the high end of the market. We are building the best possible products and they happen to be expensive to produce. We’re not talking particle board or injection molded plastic here. 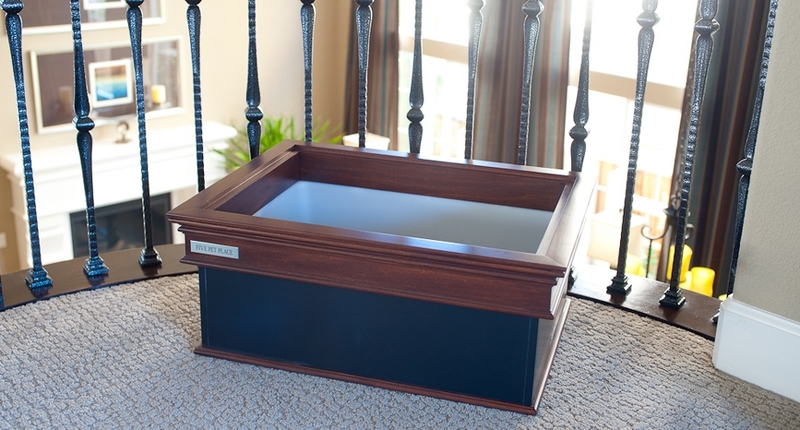 We’re talking handmade products built to standards equal to or better than home furnishings. that stand out in your mind? I’ve been around cats for over 40 years and, yes, they’re wonderful. I enjoy their company and personalities. Pretty much everything about them except when Lucy steps on the phone during a conversation with a magazine editor like she did a few days ago. My pleasure. Thank you. Be sure to check us out on Facebook and Twitter, too. In full disclosure: We did not receive any compensation whatsoever for featuring Michael and his products on Cat Chat. We did not receive any free products or any discounts. We found Michael and his products online and think they are simply superb. THAT is what made us want to share them with you! That is some darn nice and fancy things!!! That sure is fancy furniture... Love it. How I wish I could afford that. Brad, we ship worldwide. We just shipped an order to Australia this morning. BTW, thanks for the nice comments, everybody. the furniture/servers are simply exquisite!!! Glad to see that so many of you agree! 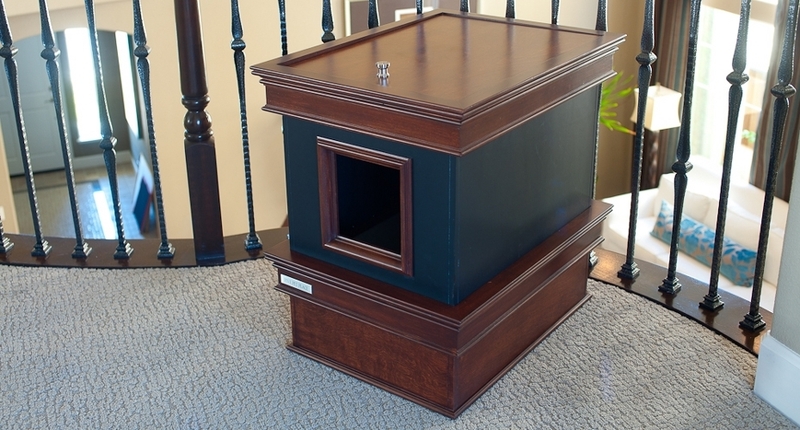 What beautiful cat furniture and accessories! Me thinks they would all complement my loveliness! Kudos to Michael for creating such wonderful pieces. Now me is off to fivepetplace.com!